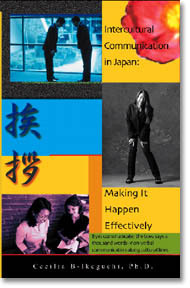 This book analyzes foreigners’ cultural adjustment patterns in Japan in relation to the non-verbal code of the “bow” and its corresponding eye movement and hand position. We have seen the simultaneous development both in terms of human interaction and the progress of communication and transportation technology since the latter half of the twentieth century. These social changes have created an increasing demand on people from different cultural backgrounds to encounter each other during travel, study, business and other various professional transactions. A heightened acceleration of face-to-face interaction among members of different cultures brought to light issues of cultural diversity and multiculturalism. At the same time, increased travel opportunities resulted in the creation of a closely interwoven network that calls for ways to reduce cultural barriers and promote closer interaction in various spheres of human society. This transformation has no doubt rendered the world a smaller place more than ever. Furthermore, the increased frequency of face-to-face interaction among people of different cultural, ethnic, social, and religious background calls us to create an open mindset, and see things through the eyes of others, whether host or new to a culture. People have increasingly realized that beneath the surface of every international and domestic affair lies a diversity of cultures and subcultures that provides the rich material for both direct human encounter as well as for point-to-point interaction. The purpose of this book is three-fold. First, it presents the results of a study on non-verbal communication in Japan. Exploring insights on nonverbal communication is a first step to a successful cultural adaptation in this country. 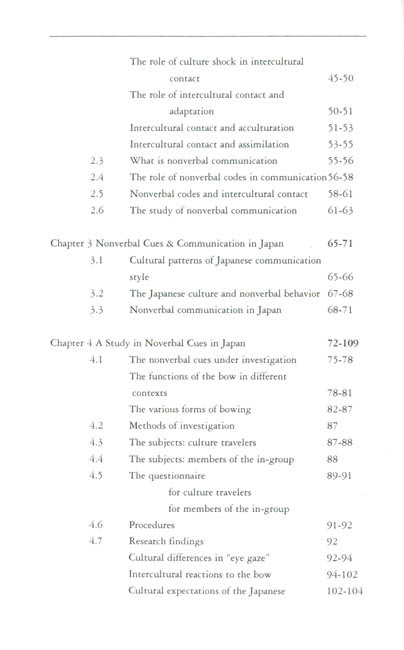 Studies on non-verbal communication have focused largely on descriptive accounts (Klopf & Ishii, 1987) and/or anecdotal reports of culture-specific experiences (Matsumoto, Wallbott & Scherer, 1989)). 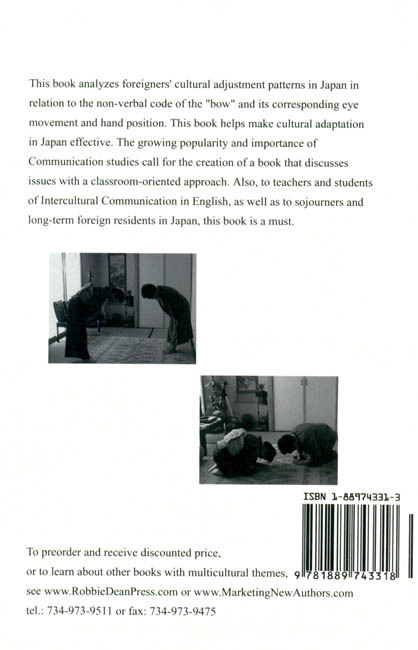 This work situates the non-verbal communication experiences of people from various ethnic and cultural backgrounds within the Japanese culture, and within the whole context of international communication. In so doing, it accomplishes the second goal: to show the explicit relation between international and intercultural communication. The continued expansion of and interest in these two fields of study, both in research and in the classroom, has given rise to some questions. Some of the most frequently asked questions by students include: “what is the relationship between these two fields of study?”, “are they two separate things?” and “how can we draw the dividing line between them?” No doubt, many books have been written about communication. Some books discuss the different types of human communication: personal, interpersonal, mass and business communication. Some books analyze the application of technology in communication; still others are about cross-cultural contact. 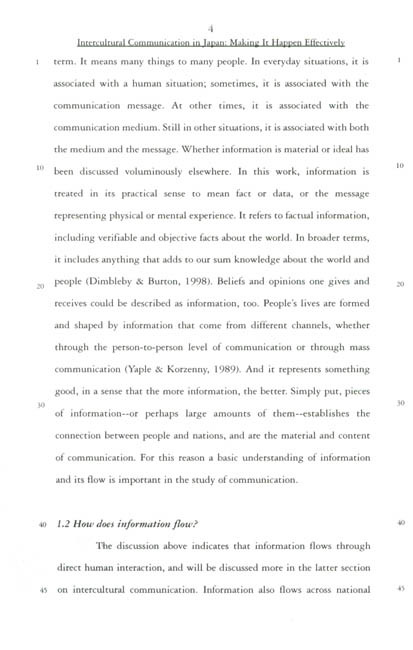 Many other books have been written about the theoretical approaches on the different aspects of communication, and perhaps their practical applications, and are difficult for beginning students. This book brings together relevant issues on communication research and practice to provide a general introduction to the field. 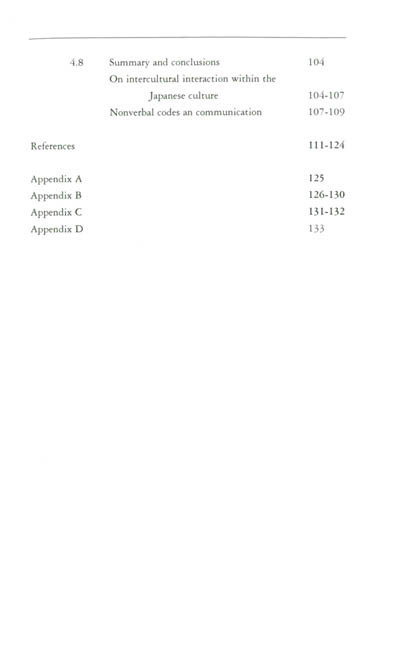 It gives an extensive list of related studies, and the student is encouraged to read those that are of interest. By clarifying some general terms and concepts this work aims to situate Intercultural Communication within the larger umbrella of International Communication. It discusses concepts on International and Intercultural Communication in a summative way for easy understanding of university students who are learning communication for the first time, and learning it in English, as a foreign language Lastly, this book provides useful insights on coping and adjustment of sojourners and long term residents in Japan, where the unspoken message is a rule, and where non-verbal communication is a must. A study of both intercultural and international communication should begin with a clear understanding of Communication. 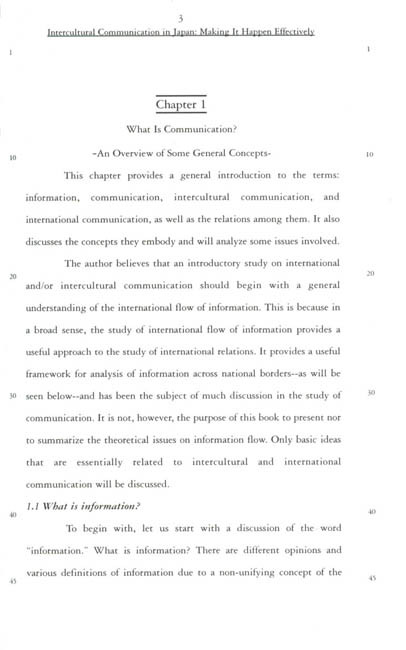 Chapter 1 introduces “Communication” as a study, and discusses general concepts related to Intercultural and International Communication based on existing literature. It is useful to the classroom teacher and students, as a friendly introduction to these fields of study. An attempt has been done to include some of the major issues to help students understand central concepts in communication studies. These concepts are particularly helpful to beginning students in understanding discussions in the latter parts of the book. At the same time, it can help teachers of Intercultural/ International Communication classes design a syllabus for the course. By drawing up insights from volumes of studies on the field, Chapter 2 analyzes some important issues on Intercultural Communication research. Of particular interest in this study are intercultural adjustment and adaptation, culture shock, and nonverbal communication. This part of the book will link the different types intercultural communication discussed in Chapter 1 to the actual experiences of the different types of international travelers on short or long time duration in different host countries. Chapter 3 presents the results of a study on the adaptation process and problems of two groups of foreigners: the sojourners and long term residents introduced in the previous chapter. The focus of discussions is on the psychological process of sojourners` adjustment and long-term residents` adaptation in Japan in reference to the nonverbal codes of ‘bowing” and “eye contact”. 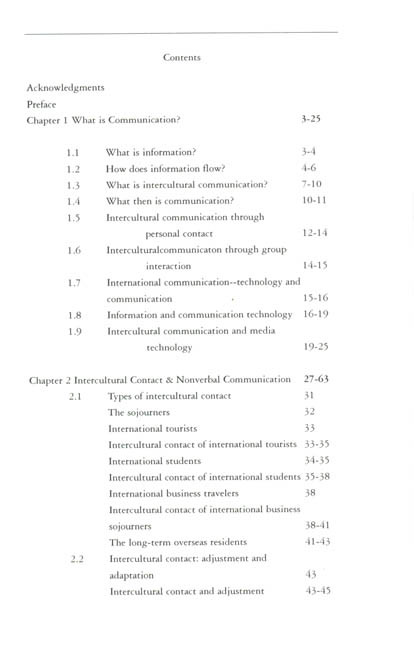 To the academicians and empirical researchers, it is the hoped that this chapter will provide useful insights on Intercultural Communication Studies that are culture specific. 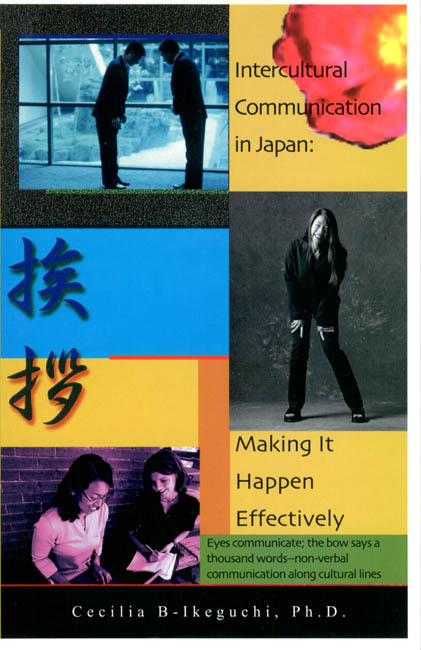 Last but certainly of equal importance, it will prove a useful guide to an understanding of nonverbal behavior of the Japanese. Thus, to short-term travelers, as well as long-term residents in Japan, this book is a must. Dr. Cecilia B-Ikeguchi, an Associate Professor in Tsukuba Women’s University in Japan, has been teaching English as a second and foreign language in various universities well over fifteen years. She has a Master’s in English Education and a Ph.D. in Educational Research. Her research interests are on the areas of Second Language Acquisition, particularly Language Testing, as well as on Comparative Educational Systems. Currently, in addition to her teaching responsibilities, she lectures on intercultural studies and serves as one of the associate editors for the International Journal for Teachers of English Writing Skills.